Death Toll Near 100, And Likely To Rise, From Storms In Mexico : The Two-Way Twin disasters — hurricanes that this week struck both sides of the nation — have been devastating. An additional 68 people in one village are missing and presumed dead after their homes were buried in a landslide. 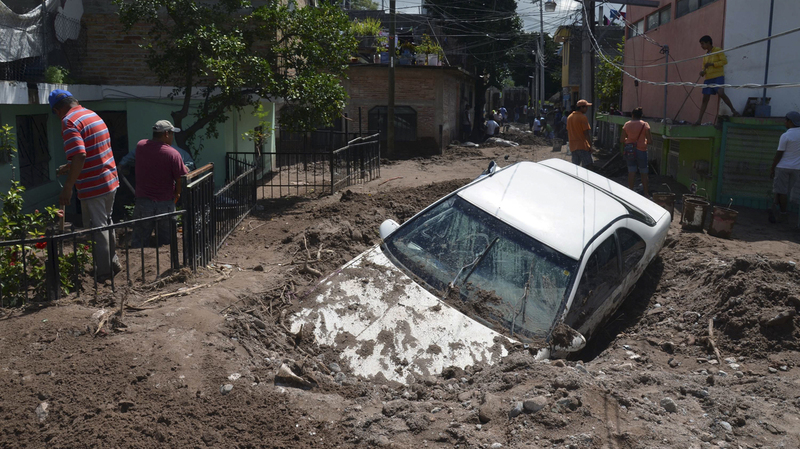 A car lays buried in mud after flooding triggered by Hurricane Manuel in Chilpancingo, Mexico. Authorities were saying early Friday that at least 97 people were known to have died in the flooding, mudslides and other deadly after-effects of the two storms that struck the country this week. Torrential rains and then-Hurricane Manuel lashed the west coast of Mexico, particularly in around Acapulco. Hurricane Ingrid pummeled the east side of the nation, along the Gulf Coast. "The Army is struggling to evacuate villagers after the landslide and is rescuing others in remote outposts where mountains have collapsed or are at risk of toppling, Interior Minister Miguel Osorio Chong said. Hurricane Ingrid on the east coast and Hurricane Manuel's first blow as a tropical storm on the Pacific drove more than 50,000 people from their homes and stranded 40,000 more in the resort city of Acapulco, which is also in Guerrero." From the tiny village of La Pintada several hours' drive northwest of Acapulco, The Associated Press writes of the terror that struck when "a tidal wave of dirt, rocks and trees exploded off the hill above the village, sweeping through the center of town, burying families in their homes and sweeping wooden houses into the bed of the swollen river that winds past La Pintada on its way to the Pacific." It's in La Pintada where 68 people are missing and feared to be dead. About 800 people lived there before Monday's disaster. "Manuel later gained hurricane force and rolled into the northern state of Sinaloa on Thursday morning before weakening over land. By Thursday night it had degenerated into an area of low pressure over the western Sierra Madre mountains, the U.S. National Hurricane Center said."